Have you ever dreams of having a soothing massage, without leaving the comfort even of your home? Well, wake up! There is no need to go on dreaming because that feeling you are longing for may actually be realistic than you thought. With the best Zero Gravity Massage Chair, it not only is convenient but less costly in the long run. I mean, we all know that professional massages can cost an arm and a leg. This type of massage chair may be the answer to your aching body’s needs. Check out some top reviews and a detailed guide to help you pick an ideal zero gravity massage chair. You may now be asking yourself what Zero gravity is. Well, here goes. Zero gravity is the position that astronauts have to sit when they are launching into space. It is a carefully designed position that allows you to distribute your weight evenly across the body. This position also helps alleviate stress off your spine. Basically, you will have to lie in a reclined position, placing the legs above the heart level and therefore also increasing blood flow to the heart and body. It is important for you to understand that this type of massage chair is not only for relaxation. As a bonus and most importantly, it has amazing health benefits. To begin the zero gravity posture removes weight from the spine, thereby reducing pain in the lower back. Secondly, with the feet above heart position, blood flow is increased in the body. Better circulation also makes your skin glow. For those with breathing problems, this may be your solution. It also helps reduce swelling of the feet. Zero gravity position helps in opening up the airways and is helpful to those with sleep apnea or asthma. Finally, this position is optimal for total body relaxation. It relaxes the back and neck. I bet you will feel like a whole new person after that. It is eventually that time when you want to pamper yourself, but you are not sure how. In that case, the Kahuna Massage chair will give you what you need. For starters, this smart zero gravity chair scans you’re your full body to determine your measure mats in terms of body size then customizes a massage just for you. It works on your whole body perfectly. The chair also has the capability to avail six different programs to make your relaxation like the yoga stretching programs that work on the whole body. Just in case you are afraid of getting carried away, the chair has a timer with which you can set up to 30 minutes. Your feet are also well taken care of as the chair has twin rollers in the foot area. The foot area is made of premium quality cotton material and detachable. It can easily be washed for hygiene. Luxury is a byproduct here. The chair has been plushy padded with the shoulder airbags double layered. The foot area has also additional foot padding. This chair not only serves as a tool for relaxation, but it has been registered by the FDA for medical purposes. Imagine being able to get a soothing massage and heat therapy all at the same time. Amazing, Right? You can get all that and more with the Real Relax Massage Chair Recliner. Inbuilt heaters ensure you can get a wonderful heat therapy to maximize the relaxation. This high-quality chair is made of long-lasting materials, including the best hardware, software, and upholstery. It’s no wonder it is a beauty and is easy on the eyes. Due to its high-quality makeup, you are assured of many years of service without the effects of wear and tear. Plush padding ensures your comfort as you sink into the softness to enjoy your massage. Eight massage roller ensures that your back and feet are well taken care of. Your body, legs, arms, and shoulders get proper attention from the 50 airbags strategically placed in the chair. Mobility is one of the features of this chair. Fitted with twin wheels, you can move it from one place to another with relative ease. You can move it out to the balcony to watch the sunset as you get a leisurely massage. The RELAXONCHAIR, just as the name suggests, provides you with optimum relaxation. Its technology allows the chair to provide a deep tissue massage. It has the ability to offer very intense massage that gives you the feeling of having a manual massage. The back heating option is also a wonderful function of this Zero gravity chair. It certainly is a welcome relief for those with chronic back pains. For those occasions when you prefer to have only specific areas worked on, this chair caters for you. Dual heating pads to work on your back, twin airbags to work on your wrists and forearms and multiple side airbags to work as calf and foot massagers. These airbags have a bottom spinning roller that works by applying concentrated pinpoint massages. Using the remote control, you can select a specific massage function to cater for exactly what you want. The chair even comes with a large screen to enable you to view the activated functions. This top performance kahuna Chair is a versatile chair that meets the needs of even the tallest users. It is a Zero gravity chair that features the latest S and L- track designs. This provides comfortable seating for you. This design also works to provide a wonderful massage for your back and thighs. The chair provides an advanced six roller system that is therapeutic. It gives you a feeling of being massaged by three pairs of hands. The massage options include kneading, tapping, knocking and a combination of the kneading and tapping. The yoga stretch function is a welcome addition to the features of this chair. The stretch function ensures that it gives you a thorough service taking pressure off your back and leaving your back feeling rejuvenated. Refresh, Recovery, Relax and Pain Relief are the other premium programs offered by this unique chair. A remote control that comes with the chair lets you conveniently set your preferences without the cumbersome time-consuming button punching. All the functions are at your fingertips. This convenient implement even lets you set the timings and duration of the massage making it truly convenient. When it comes to maximum massage options, then look no further than the NEW FOREVER REST FR-5Ks PREMIER. The manual mode allows you to enjoy seven different massage variations. These are the Shiatsu, Knocking, Kneading, Tapping, Rolling, Seat Vibration and a combination of Tapping with knocking. If you are a taller than average persons and you may have been having a hard time getting a chair that will give you proper service, look no further. This particular chair was made with you in mind. This is because the leg massager of this chair is extendable. All you need to do is push it out and relax. The rolling foot massage plus the calf acupressure ensures total relaxation of your feet. One of the most loved features of this chair is the Yoga mode. As soon as it is engaged the chair will automatically pull your feet downwards as it squeezes your feet and legs. The backrest will pull your upper body to recline making the experience a wonderful one. The larger “pull area” makes it more convenient. This RELAXONCHAIR has an ergonomic design that ensures that the chair not only fits all people, but also provides a perfect fit because it has been molded with the human form in mind. When it comes to space economy, this is one economical chair as it needs a minimum clearance of three inches from the upright position to the reclined position. It comes with five massage settings that come predefined. However, it allows you to input a maximum of three programs as per your preference. The internal memory of the chair is able to recall your favorite massage techniques, target areas, sped intensity etc. 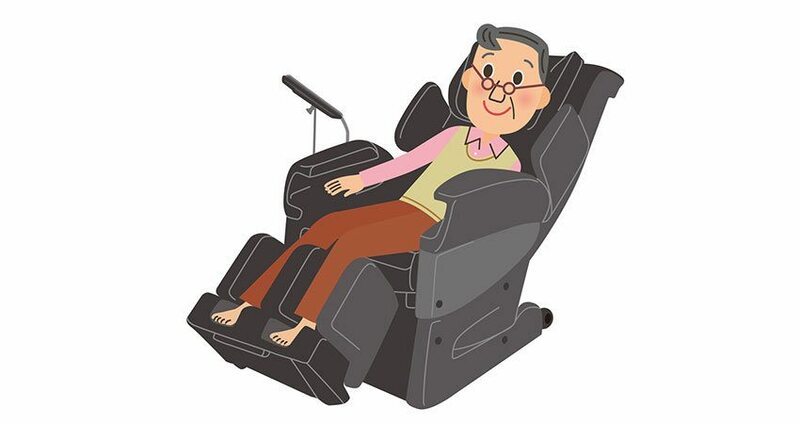 The Zero Gravity chair provides the ultimate massage experience whereby you can choose from knocking, tapping, Shiatsu, kneading and a combination of tapping and kneading. Back heating is provided by carbon fiber wires. Foot massaging is done by 20 airbags that massage the backs, front and heels of your feet. The chair allows you to make shoulder adjustments so as you place the massage points just where you need them. This Osaki model has been upgraded to provide you with a most enjoyable massage experience. Despite the upgrade, it still remains a zero gravity position chair. This means that the chair gives you the total relaxation that only in this position can provide. This chair gives an alternative air massage option. This massage is enabled by using what is known as “Next Generation Air Massage Technology”. It uses airbags that create subtle compression and twisting movements, by inflating and deflating airbags in the chair. Shoulder, arm and hip kinks will be a thing of the past. You can also initiate a full body scan by just the push of a button. Once the scan ends the rollers readjust themselves to put pressure on the appropriate points, as the computer indicates. The length and width of the seat also readjust to your specific needs. The technology focuses on the most problematic problem areas with the main focus on the neck, Lumbar and shoulders. For your tired feet, this chair is ideal as it has an attached foot massager that will soothe your aching feet. An upgraded roller system works with a spinning motion to gently massage the acupressure points. Airbags and foot rollers help improve blood circulation, relieving any soreness. Automatic programming gives you several options to make your experience wonderful. You can choose from Stretching, Demo, Thai, Anti-Stress and Muscle Relief with each targeting a specific area. The massage selection includes Tapping, Swedish, Kneading, Rolling, Shiatsu and Clapping. Plus, you can adjust the intensity levels of your massage up to five times. It certainly can’t get better than that. The Hutbot has been made with the human form in mind. Its ergonomic design ensures that you are not only comfortable but that the chair molds your body perfectly. The HLS tracking system ensures that you get a wholesome experience. The chair offers a smart scan technology that ensures that the chair will work on your problem areas. The scanner works to determine the areas that need attention and work on them. Your feet are not left behind in this massage experience. The chair comes with three rollers that come in twos and move in multiple directions to soothe the feet. The specifically target the acupuncture points in a spin direction. Roller blades situated at the calf region along with airbags and heating system at the calves make the massage experience satisfactory. Technological advancements have made it possible for the chair to be operated via a mobile app. So you don’t have to worry next time your remote control is out of batteries. Just tap into the app on your phone. The zero gravity positioning in itself is full of health benefits. These include improved breathing, increased blood flow, and relaxation. The chair is also very economical when it comes to space consumption. At a maximum, it needs an allowance of only 6 inches to fully stretch out from the normal position. They say the first impression is the last that is why the ZeroG 5.0 has been designed to look good. It does not only make a good impression but also leave your body with a good impression. It employs the 3D smart technology that gives a wholesome massage experience. To start off it has four massage programs, the Refresh, Relax, Retreat, and Sleep. Coupled with the compression, kneading, tapping rolling shiatsu and stretching massage techniques you have a variety to choose from. This ZeroG massage chair has a patented heating technology, that employs the use of dual columns of heated air that is more penetrating, and the heat penetrates deeper. This is very therapeutic for the lumbar region where the heating is positioned. This technique is less corrosive to the hardware, thus ensures that your chair has a longer life. The chair has a paddle adjustment option that allows you to move the paddles to the specific points that you want the massage to be concentrated. The foot paddle is also adjustable as it can be pulled out to accommodate people with a height of up to 6’3″. Adjustment of the foot paddle is easy all you need to do is pull it outwards. The chair also uses the Circulation patented technology that is mostly directed to soothing the calves in an upward movement to release tension. It is abundantly clear that using a gravity chair provides not only comfort and relaxation, but it is also medically therapeutic. But all these benefits will accrue if you only invest in the right chair. With a myriad of options widely available in the market, you may have a hard time selecting a chair. That is why we have made a list of the most important considerations to keep in mind, just for you. The essence of buying a reclining chair is to attain total relaxation. That is why in selecting a chair you must look at the chair and your body type and build. It will be counterproductive to buy a chair that you have to squeeze in to fit or one that is too short for your height. Look for something that is exactly your size. It is very uneconomical to spend too much money on a chair you will use once in a blue moon. You must, therefore, take into consideration the regularity in which you will use the chair. For a chair that you will use often, you should consider one with a durable makeup and easy to maintain. Do you plan to use the chair both in the house and outdoors? Or will it be a permanent fixture in the house? An easily portable chair is ideal for moving. Consider a chair with wheels and one that is relatively lightweight if you intend to move it around. Now, this is very important as some chairs are specially made to deal with specific medical conditions. Depending on whether the chair is for leisure or medicine, you should ensure that you select the one that specifically caters for your needs. Are you keen on having the latest in the market or just something practical that will cater to your needs? Consider this as you look at the items on the market. However, it is important to note that the fancier the chair the deeper you have to dig into your pocket. All in all, it is important to ensure that your choice of a Zero gravity chair is determined by its use, practicality and of course your pocket size. We have reviewed the best options that are available in the market. The most important pointers to consider, and now it is time for you to make a choice. We hope that you get the perfect chair from our guide. For any queries do not hesitate to contact us, we are always happy to help. Be warned though, zero gravity chairs are extremely relaxing. You may end up spending most of your time just enjoying the experience. Enjoy your shopping.